SALT LAKE CITY — Utah Arts & Museums announces A Call to Place: The first five years of the Frontier Fellowship. The exhibition highlights the town of Green River through a project initiated by Epicenter, an interdisciplinary nonprofit organization. The town of Green River lies within the lunar landscape of eastern Utah: rock cliffs reveal striations of sediment with boulders clustered below fracturing buttes. Green River is a place where the land is plentiful and the red dust, burnt cliffs, and lonely sky lie just beyond the end of its roads. Prismatic sunsets give way to stars that shine bold and close. If you’ve never seen monolithic terraces under an oceanic sky, Green River is the seeing place. The only town of consequence for many miles, Green River has been a welcomed sight to travelers for well over a century. Uranium mining, the construction of a missile base, and other economic booms led to times of prosperity that proved short-lived. As jobs disappeared and the newly built Interstate 70 routed travelers around, rather than through the town, businesses closed shop, buildings fell into disrepair, and the town’s population dwindled to its current size of 952. During the recent recession, Epicenter began partnering with the city and residents to reverse Green River’s economic misfortunes and strengthen the community. Epicenter’s visiting artists, “Frontier Fellows,” prove an integral part of this revitalization by discerning and celebrating Green River’s rural pride and pioneering spirit. 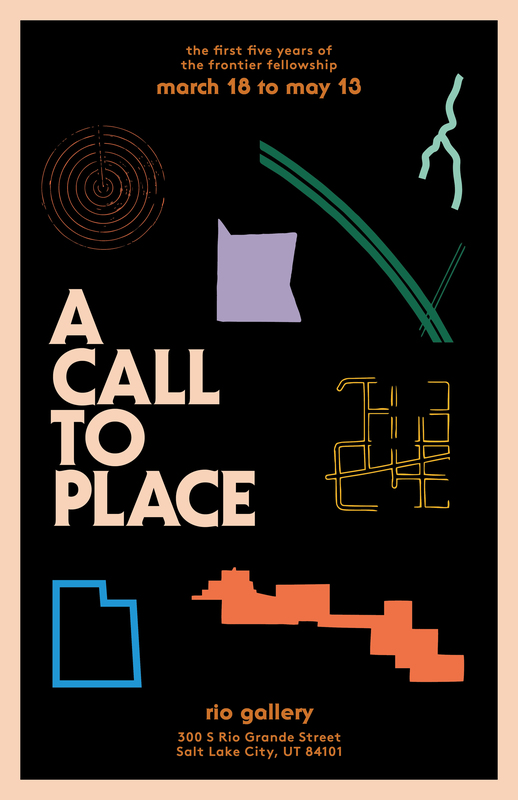 The exhibition, A Call to Place, features the first five years of Frontier Fellows, 50 visiting artists and collaborators who have each spent up to one month in residence generating place-based work in Green River alongside the community. The exhibition runs from Mar. 18th-May 13th, 2016. An artist reception will be held on Mar. 18th from 6-9 p.m. for Gallery Stroll. The Rio Gallery is located inside the Rio Grande Depot at 300 S. Rio Grande Street, Salt Lake City. Gallery hours are 8 a.m. to 5 p.m., Monday – Friday. Additionally the Gallery is open in partnership with The Downtown Winter Farmers Market every other Saturday from 10am-2pm from January 16th-April 23rd, 2016. Thanks to the National Endowment for the Arts (Artworks), Utah Division of Arts and Museums, AmeriCorps VISTA, and Steve and Juanita Sykes for their generous support of this project. Charlotte XC Sullivan, Zoe Minikes, Zorth Pilioneta, Miles Mattison, Nick Zdon, Daniel Strauss, Nicole Lavelle, Ali Osborn, Jamey Herman, Richard Saxton, Sarah Baugh, Justin Flood, Raphael Griswold, Emily Howe, Aidan Koch, Shawn Creeden, Catherine Page-Harris, Kristina Fong, Corbin Lamont, Zach Bulick, Russell Kerr, Cabin Time, Erica Dixon, Dylan Adams, Bennett Williamson, Gina Abelkop, Colin Bliss, Lucia Carroll, Cyrus Smith, Sincerely Interested, Michelle Benoit, Molly Goldberg, Mary Rothlisberger, Celia Hollander, Ryan Ford, Grayson Earle, Jordan Topiel Paul, Andrew Hamblin, Spence Kroll, Eliza Fernand, Geoffrey Holstad, Rob Loucks, Pete Collard & Alice Masters, Lisa Ward, Emily Howe, Jordan Gulasky, Phil Dagostino, High Desert Test Sites, Laurelin Kruse, and Sarah Lillegard. For more information on the Fellowship visit frontierfellowship.org.